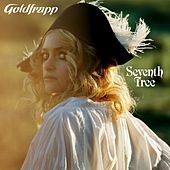 On Seventh Tree, Goldfrapp ditch the glam and decadence of their past two albums and go flower power. With brass, autoharps, woodwinds and drum loops, "Little Bird" and "Cologne Cerrone Houdini" evoke the mellotron nostalgia of "Strawberry Fields Forever," while "Happiness" could fit seamlessly into a modern rendition of Hair. It may take some getting used to for fans who discovered the duo while discoing, but their turn from platform glitz to barefoot chic is beautifully underlined with an Air- and Sia-like downtempo-folk that accentuates Alison Goldfrapp's soaring sultriness.